NORTH BEND, Pa. — Dave Rider followed the zig-zag trail of blood and paw prints through the snowy terrain of the Pennsylvania mountains. The snow was a nuisance all day. Hunters like a light dusting to reveal tracks, but too much makes for a day of soggy discomfort. Clinton County was smacked by an icy snowstorm ahead of the state’s four-day bear season. But no amount of dampness or cold was going to stop Rider from seeing this kill to the end. After decades of missed shots and uneventful hunts, he was ready to get his first bear. North-central Pennsylvania features deep cut mountains and rolling hills. As the terrain gets more harsh and less populated, the bear hunting gets better. The state is home to some of the most active bear hunting in the country with more than 170,000 registered hunters. The next closest state is Maine, which has fewer than 10,000 registered bear hunters. Yet, despite the big numbers, the average success rate for a hunter over those four days in mid-November is only 3 percent. North Bend, in the heart of bear country, about 165 miles northwest of Philadelphia, is a small town in a mountainous cocoon. Its local fire department is home to the Clinton County’s most vibrant weighing station, the social hub of the bear hunting community. Think of it as the water cooler scene, but with blaze orange, muddied trucks, bleachers and, of course, freshly killed bears. “There’s a circus-like atmosphere on opening day,” Ternent said. The station is where those 3 percent of hunters get to take a victory stroll. Every bear that a hunter kills has to be brought to the weighing station, where the animal is weighed by a makeshift and truck-friendly scale. Fires supposedly don’t happen in North Bend when it’s bear season. The fire chief was posted behind a tray of fries throughout opening day, waiting for an order and joking around with the other volunteers. Deb Risley, a nurse at a hospital 30 miles away in Lock Haven and volunteer for the fire department, took the hunters’ orders. Earnings from the food sales during bear season, along with a raffle for a rifle, help boost the fire department’s funds. 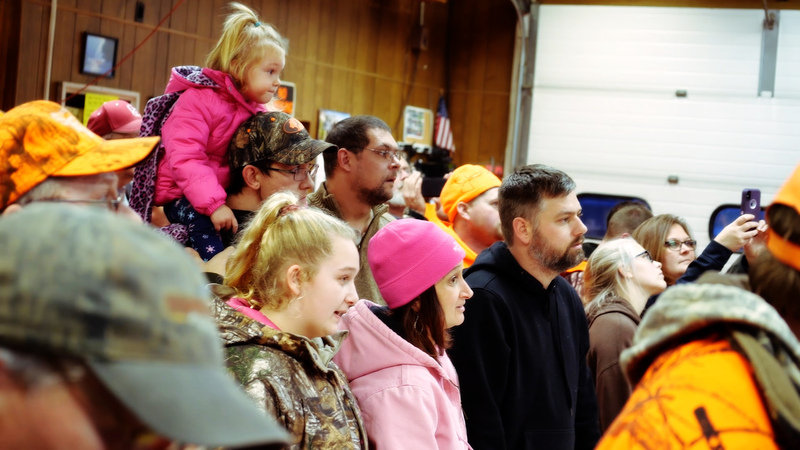 In one spot, a group from Ohio, where bear hunting is illegal, anxiously watched the TV to see if their No. 10 Buckeyes squeak by unranked Maryland in football. Hunter Bruner, an 18-year-old Ohio native, had the bragging rights among them. Using the same gun he used when he started hunting bears at 12 years old, Bruner made his first kill. The weighing station’s currency is in a good hunting story. Bruner’s story was unheroic. He was about to head out of the dense forest to have a lunch break when he came across a 261-pound bear clawing at a tree. “I was like, ‘Oh, no way,’” Bruner said. The most common technique for hunting is a drive, when a team of about 25 hunters combs through the woods. Scott Geiser, who hunts with his childhood friends from Pennsylvania, met up with his crew at 5 a.m. The snowfall the night before led Geiser to his first ever kill. He followed bear tracks into a dense thicket, a common bear environment, and spotted the animal within 20 minutes. “It was 10 seconds of total excitement,” Geiser said. Then came the toughest part. In Lycoming and Clinton counties, where bear populations are most dense, the terrain is a serious challenge — even more so when you have to drag an animal out of the woods. “The only level ground may be where you park your car that day,” Ternent said. A couple dozen spectators sat along soccer bleachers placed in the fire department. People arranged themselves around trucks as they pulled in, and tried to get a good look at the bears. Parents brought their children around police tape so their kids could feel the bear fur. Risley took her grandson up to pet a bear in the back of the truck. “That’s bear,” the toddler said as a game commissioner drew a blood sample from the opening in the gutted animal’s stomach. Their main home is over 135 miles south of North Bend, but they come to the area to enjoy the peace and nature. Just on the first morning of bear season, Gail saw 10 turkeys, a buck, a doe, and on the drive to the fire department, an estimated 40 elk crossing a creek. “And an eagle,” Craig added. Most bears that the couple saw were the hunter’s first kill. That’s not a coincidence, as it is rare for a hunter to even see a bear while hunting. “It’s like the lottery almost,” Craig said. The fire station in North Bend is packed on the first day of bear hunting. Ternent made very clear how important bear hunting is to the health of the population. A detailed bear management plan he created over a decade ago details the history of Pennsylvania’s bear population, how bears are hunted, why they are hunted and some fun tidbits about bear fertility. The bear population is stable in Pennsylvania at around 20,000 bears. That number has been consistent over the last five years. And with the occasionally gory scenes in the fire department, it might be hard to see the annual event as part of a culture that appreciates bears. But it’s safe to say that few people love the animals as much as Ternent. “I made a career out of protecting the bear resource,” Ternent said. Ternent sees hunting as integral to stabilizing bear populations. Even at 3 percent, the success rate over those four days erases about 20 percent of the bear population, but that loss is replenished before next season starts. Bears in Pennsylvania have some of the highest reproduction rates in the country, and the size of litters is typically around three or four cubs produced by a single female bear every other year. The harvest over the 2018 hunting season was just over 2,400 bears. Bear hunting is tough sport. Bears reside in difficult terrain. The weather is rarely supportive. The meat gets mixed reviews. “If it’s prepared right, it’s good meat,” Craig Frantz said, which is about as enthusiastic as it gets. Ternent suspects the challenge is an aspect of bear hunting that keeps people coming back. “There’s a lure of a species that you’re not going to get every year,” Ternent said. Most hunters don’t expect to shoot a bear when they head into the forest. What other sport is out there in which failure is so readily accepted and excepted? When Rider, who also hunts deer, followed that trail of blood to the end and finished his kill, he had reached his goal. But the dream of finally getting a bear wasn’t what kept Rider coming back for 30 years. It was the men in blaze orange around him.